Call now on (021) 450 6190 for a free demonstration. 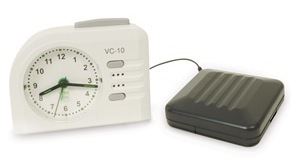 A variety of alarm clocks created especially for the Deaf and Hard of Hearing, allow you to choose one which best suits your needs. Alarm clocks may have an extra loud alarm bell, a vibrating pad, that can be placed under the pillow, a large visual display or a strobe light. You may order a special baby alarm, which connects a microphone placed near your baby to a flashing alert light and vibrating pad. Specialised doorbells can have features which include a silent, flashing doorbell or extra loud audio functions. If you are Hard of Hearing and you do not wear a hearing aid, listening devices can help to improve communication in difficult listening situations. These devices consist of a small microphone, which delivers amplified sound to your ears via headphones. They also have volume control and are lightweight and easy to use. With a pager system, transmitters placed near a sound source trigger a vibrating, flashing or audio response to a receiver which alerts the user. This is a very useful way of monitoring activities at home or at work. Smoke alarms, created especially for the Deaf and Hard of Hearing can alert using a flashing light, extra loud volume and vibrating pad. We can source a selection of specialised telephones with speech and ring tone amplification, hearing aid compatibility and flashing lights to alert of incoming calls. The effects of Tinnitus can be soothed by use of sound maskers. These devices ‘mask’ the effects of Tinnitus by playing a selection of relaxing sounds, such as ‘rainfall’ or ‘wave’ sounds. Many of these maskers can also be purchased with aromatherapy features. We also stock a selection of relaxation CDs. The Sound Pillow is a device, which may help people with tinnitus to gain relief while trying to sleep. It consists of a typical pillow, which incorporates speakers that connect to a sound source such as a CD player. A variety of equipment can assist you in hearing the television and radio. 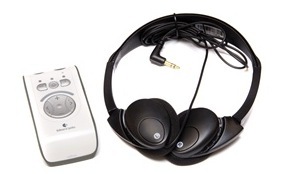 Some devices transmit amplified sound directly to headphones, while others connect directly to your hearing aid.